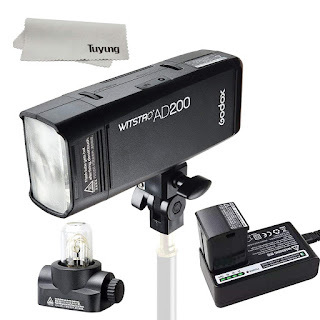 The AD200 TTL pocket flash kit from Godox is built around a unique flash light source that has a standard speedlite head and a bare bulb head that give you the option of 2 distinctly different qualities of light. The kit comes with the 2 heads, lithium battery, charger and carry case. The speedlite head outputs the standard look of an on-camera flash that can be modified using an optional softbox, beauty dish or umbrella. The bare bulb head features a removable flash tube and produces 360 degrees of soft, bright, nearly shadowless light. The head uses optional reflectors that focus the beam angle and give you directional control. The AD200 has impressive core features such as 200 Ws of power adjustable in 8 steps from 1/128 to 1/1, recycling from 0.01 to 2.1 seconds and flash durations as short as 1/11,300 sec. The flash runs on a removal rechargeable lithium battery that will give you up to 500 full power flashes and thousands of lower power flashes. 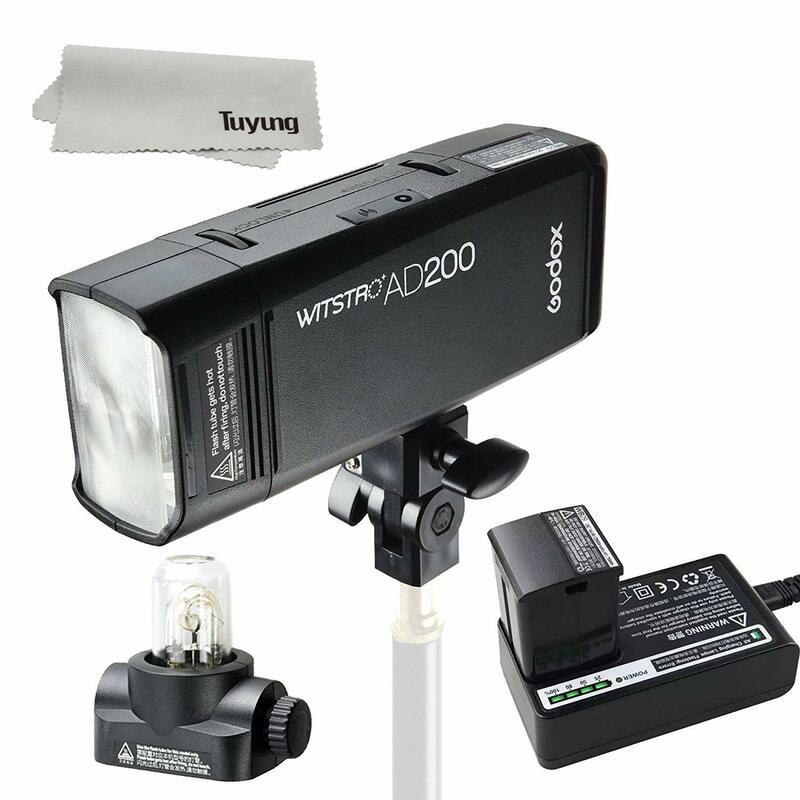 The AD200 has 3 flash modes - manual, TTL and multi (Stroboscopic). Manual outputs the user's choice of power, modeling light, first or second curtain sync, etc. Multi controls the stroboscopic rate up to 90 times (90 Hz). TTL takes advantage of the flash head's built-in X1 receiver. Optional X1 TTL transmitters are available for Nikon, Canon, Sony, Olympus, Panasonic and Fuji cameras. They will also detect a separately purchased LED head. The 32-channel wireless system controls flash mode, first and second curtain sync, High-speed sync up to 1/8000 sec, power level, modeling lamp and ready beeper at distances up to 328'. Firmware updates are obtainable on the Godox website. Built-in wireless receiver: control triggering power level, alert beep with optional wireless transmitter. Compatible with Nikon, Canon, Sony, Olympus, Panasonic and Fuji TTL. Bare bulb and speedlite flash heads are included to vary your quality of light. Color temperature is a steady 5600K over the entire power range. The 14.4 V/2900 mAH battery pack gets 500 full power flashes with 0.01 to 2.1 sec. recycling. Easily readable digital panel displays your adjustments. Barn boors, color filters and diffusers are available to personalize your work. 8-step power range: 1/1 to 1/128, supports flash exposure compensation, 1/8000 sec high-speed sync, first and second curtain sync, modeling lamp, manual flash, multi flash and custom functions.